This is a program that we researched for many years, and in July 2017 we finally did it. It was an amazing trip, and everyone had a fantastic time. Time to do it again! We have designed a fun itinerary with a nice mix of touring, trekking and climbing. The trip starts with your arrival in Ulaanbaatar, Mongolia where you will meet your IMG and Mongolian guides. After getting settled in and doing our gear checks, we have a day exploring this fascinating city, with a trip to the market, shops, and the famous Genghis Khan memorial. Mongolia is not known for its fine cuisine, but we know some nice local restaurants for our team Welcome Dinner. Then, it's off to bed for an early start the next day. The team will fly via Mongolian domestic airline across the country to the city of Bayan Olgii in the far west. From there we transfer to Russian vans (the ubiquitous form of transportation) for the drive to the trailhead, where we will spend the night and will meet our local porters and their camels! It's a beautiful trek to our Base Camp on the Potaniin Glacier of the Tavan Bogd Massif. Our loads will be carried by Bactrian (two humped) camels which can carry up to 200 kilos each. This part of the Altai Mountains is very near to the border with Russia and China. Base Camp will be our home for several nights as we acclimatize and do some glacier travel training. Then, it's time to move up the Potaniin Glacier to the High Camp. Down low it is "dry" glacier (hard ice with no snow) and higher up we cross the into glacial snow zone. Porters will carry food and camp gear to the high camp, and members will carry their personal gear. The summits of Mount Khuiten (14,350ft) and Nairandal Peak (13,714 ft) are the "Triple Point" where China, Russia, Mongolia come together in the Altai Mountains. Our goal is to climb both! These are cool climbs in a wild and remote part of the world with amazing views. If you have Mt Rainier climbing skills (crampons, ice axe, roped glacier travel) then you will enjoy these peaks. This is going to be a fun trip. Hope you can join! The whole trip from start to finish was amazing. I left thinking it was one of my all time favorites. 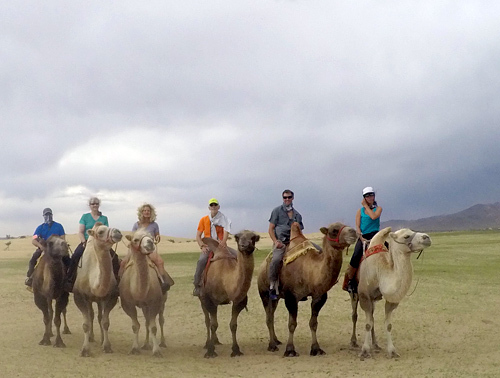 I will say that my 3-day extension to the Gobi at Three Camel Lodge was the perfect ending. It was magical... I'd like to pick out a highlight but quite honestly, there are just too many. There was a great balance of culture (loved visiting the nomadic families), cross country travel (oh my god, those Russian vans! ), sleeping with the goats, too many camel pictures to count, beautiful country and people. I am just so thankful to experience this amazing place. So where to next?? It has to be exotic. "The scenery is mind-blowing, the cultural experience is unbeatable, and the climb was scenic and rewarding. And shoot, when else are you going to go on a camel-supported trek..."
I wanted to say thanks for a great expedition. I was very impressed with the organization and facilities that were put together for the trip. Outstanding group of staff, and in general, the trip flowed with great ease because of the groundwork you've spent years perfecting. Thanks for the fantastic adventure!